Summertime is the perfect opportunity to play swimming games to cool off and have more fun than any kid stuck on land… or a couch. 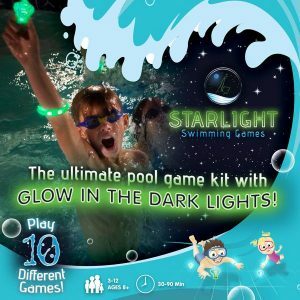 We crafted our Starlight Swimming Games to ensure kids can make a splash even after dark in the pool of their choice. No need to go indoors when the sun sets. Our glow in the dark swimming games keeps the fun going as long as mom and dad are willing to stay up to watch over the contests. One of the best things about our swimming pool games is that you’re not stuck with only one way to play. We have 10 variations to keep the games fresh and give all the kids a chance to shine with their different abilities. You don’t see 10 different ways to play Monopoly, do you? Basically you play Monopoly for six hours with no clear winner and everyone goes to bed mad at each other! For fun that doesn’t dissolve into bickering over who cheated as the banker, keep reading. 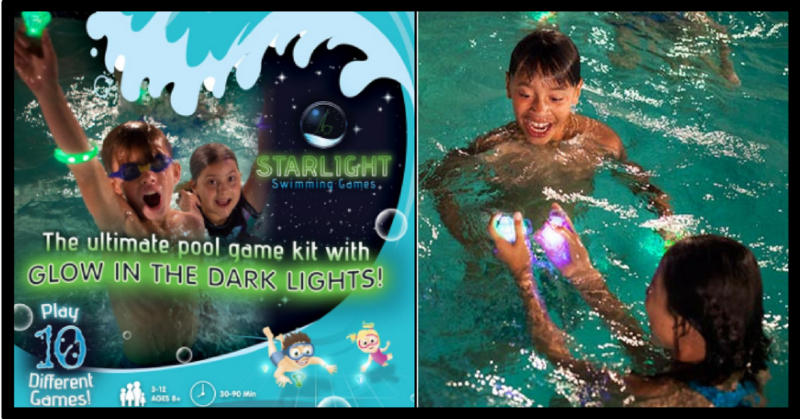 Here are details on how to have loads of swimming pool fun with three popular variations of our Starlight Swimming Games. What kid can’t get excited about freeze tag? It’s a game that can be played anywhere and anytime. Put this concept into a swimming pool and you can have hours of fun after the sun. The concept is simple. One player is designated as “It,” then all the other players put on their glowing bracelets. Now the chase is on after a quick countdown! The chosen “It” can win the game by tagging all the other players within a time limit. Sounds easy, but the other players can unfreeze each other by swimming between the legs of frozen players. BTW, players frozen with a tag in deep water must tread water until they are unfrozen or the game is over! So it’s important to rest after these contests. OK this may sound like an easy game. But the kiddos will have to push it to the limit in order to win. This game is competitive and has the side effect of cardio fitness. Two teams will compete in a glowing relay race. Better to do it after dark since you parents won’t have to sweat it out as referees and fans. Each team will have half its members on each side of the length of the pool. One player from each team starts the race by pushing their Glowing Flower to the other side of the pool. They can only use their head and chest to control the Flower as they swim! When they reach the other side of the pool, that’s when the next team member pushes the Flower back to the other side. This goes on until one team has sent all their players across the pool and finished before their rivals. To enhance this game, different strokes can be used for more advanced swimmers. We can’t get enough of Zombies even in our swimming games. Doctors may seem boring, but who else can save mankind in case of a Zombie virus? Not the local sheriff or some crooked mayor. Let’s forget that dark scenario and focus on the game. This one features two teams. Blue vs. Green. Each team will have one Doctor and one Zombie. Doctors try to touch the opponent’s Glowing Flower, which will give their team the win. Another way to win is to have your Zombie tag the other team’s Doctor. Lose your Doc and mankind falls… see? So what are the other players supposed to do in this game? Block! You know, like the low-level actors do on The Walking Dead. Get in the way so the doctors have time to work their magic. Or so your pet zombie has time to knock off the enemy’s doctor. No holding or grabbing though. Just block. If those three game variations are not enough to keep the kids and their buddies busy this summer then they must have a ton of energy! No worries. Just download all the other game variations instructions here for even more fun in the dark. We’re glad to give everyone more time to enjoy their swimming pools after daylight hours. After all, in most of the states in the USA we only get a few months a year to enjoy the water. We might as well use our swimming pools day and night to get the most benefit out of them! 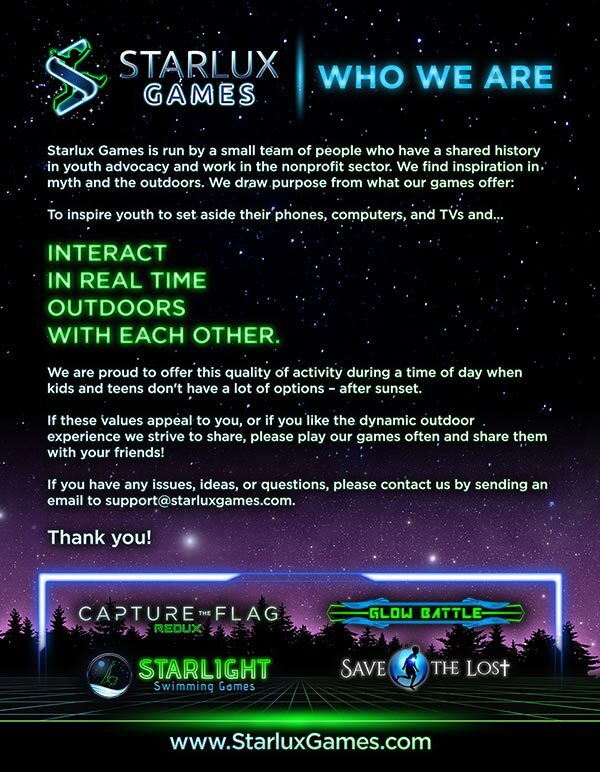 Click here to learn more about Starlight Swimming Games and to purchase our game kit.